A 3D simulation of the solar system. Obviously not to scale since it would be almost impossible to see anything like that, the planets are a lot bigger than they would normally be and they rotate the sun a lot faster than they should. Other than that, I guess it's kind of accurate, all of the planets are mapped with textures from NASA, the four gas giants have rings and everyone more or less has the proper axial tilt. Did not bother with perihelion/aphelions, any moons, asteriors, comets, Pluto or much anything else, the stars in the background were randomly generated, etc. Zoom around with the keyboard/a controller, quit the game with Escape/Start. Alt+Enter forces the game to change from full screen to a window, gamepad L/R/Left Shift/Right Shift invert x and y, respectively. Yes, Neptune's model is a smaller, blue version of Saturn, I got a little lazy. 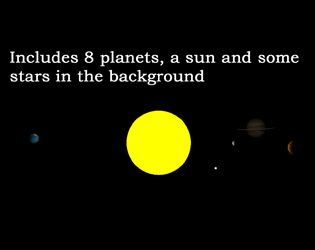 Also if you go far enough you'll end up leaving the star field, at which point the sun will be a tiny yellow dot and you probably won't be able to see the planets anymore. May update with moons, asteriors, Pluto, etc. in the future, or you can do it yourself, the .gmz project is included in the download. Update 2018-07-30: added normal smoothing on the planets so they look less polygon-y and exported it with the Yo Yo Compiler so it should hopefully work a bit better on low-end machines. I haven't found any annoying compiled-code issues but if you get a crash or something let me know.